So what about the live lice? When I went into the US Public Health Service in 1957, it was to fulfill my draft obligation after student deferments. Recall that the Korean War was from 1950 to 1953. Also that during WW II, DDT dusting powder was widely used to kill lice, especially in conquered civilian populations, to prevent the spread of typhus. But by the Korean War some lice had sneer at DDT and so something else was needed. Enter Dr. Wayland J Hayes and yours truly. Dr Hayes arranged for prisoner volunteers at the Federal Correctional Institution in Tallahassee, FL to be recruited to test the toxicity of malathion formulated as a dusting powder substitute for DDT. Malathion is an organophosphorus compound unrelated to DDT and was thought to have similar effectiveness and human toxicity. The results were published in the Bulletin of the World Health Organization, (1960, vol 22, page 503-514) and on review I was impressed by one observation: “Although one of us (J.G.S.) had received, without injury, a 30-hour application of 10% malathion powder in preparation for the study of volunteers, . . . .” My small contribution to the advancement of science. Well, in retrospect I have to say that it was safer than dodging bullets in the Vietnam War, which was waging at that time. Having recently talked about pigs from Jersey and trichinosis, I decided to see what other stories Berton Roueche had that might be of interest. Looking at the table of contents in his compendium called “The Medical Detectives” (1980), my eye was caught by “The Dead Mosquitoes.” Why did “dead mosquitoes” catch my eye? Therein lies a tale. 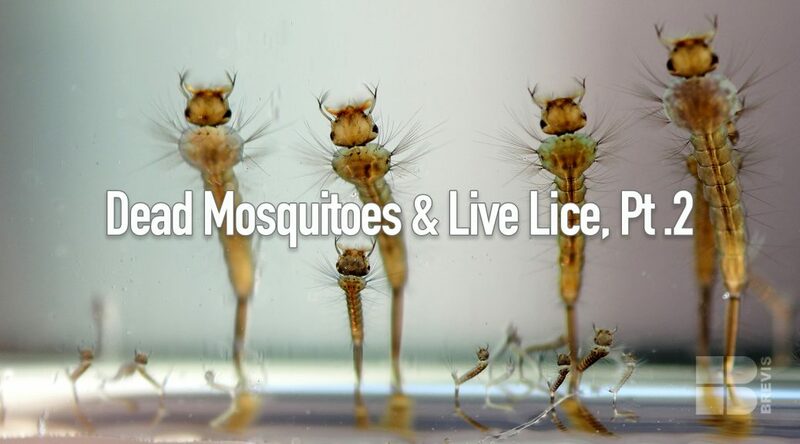 Mosquito larvae are so sensitive to insecticides that they were used for bioassays. Except when they weren’t. Also indigenous to the lab were great hordes of American cockroaches. (American cockroaches are up to 2 inches long vs the puny German variety at 1/2 inch). TDL was in a 240 foot long building. Someone at one end of the building decided to attack the roaches with a pyrethrum spray. The spray traveled 200 feet down the hall and wiped out the mosquito larvae in the bioassay lab. After that all insecticides were strictly verboten in the building which must have made the cockroaches deliriously delighted. Anyway back to the Medical Detectives. It’s a complex story of poisoning by an organophophorus insecticide that was accidentally spilled on some blue jeans that were subsequently sold at discount in Fresno, CA. A pair of these were worn by a boy who then rapidly became violently ill. Another boy wore another pair of the blue jeans with the same result. (He was diagnosed by a classmate of mine, Merritt Warren, MD, who had heard about the first case.) Pinpoint pupils, low cholinesterase levels in blood and rapid response to atropine cemented the diagnosis. But which insecticide? While waiting for a chemical analysis in a research lab, the pants were left overnight in a room with some mosquito-laden cages. In the morning the mosquitoes were all stone cold dead, killed by insecticide vapors. The insecticide was determined to be Phosdrin and it was later shown to have come from a leaking container being transported on the same truck as the package of blue jeans. One lesson to be drawn from this episode is that if the jeans had been laundered before being worn (they were not), the Phosdrin would have been washed out.